Free-agent pitcher Kyle Lohse has reached agreement on a three-year, $33 million deal with the Milwaukee Brewers with a potential for an additional $1 million in incentives. The 34 year old Lohse posted a 16-3 record and a 2.86 ERA for the Cardinals last season, pitching a career-high 211 innings. He has a career 118-109 record and 4.45 ERA in 12 seasons with Minnesota, Cincinnati, Philadelphia and St. Louis. 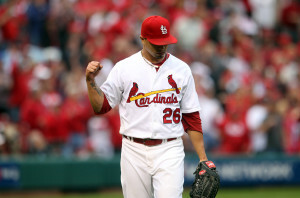 Lohse declined a $13.3 million qualifying offer from St. Louis over the winter. The Brewers will give up the 17th pick in the upcoming June draft, along with the bonus money that Major League Baseball allots to that spot. The Cardinals will receive an additional compensatory draft choice — the 28th-overall pick. Because his signing is so late is spring training, it is unclear when Lohse will be ready to make the starting rotation for Milwaukee.